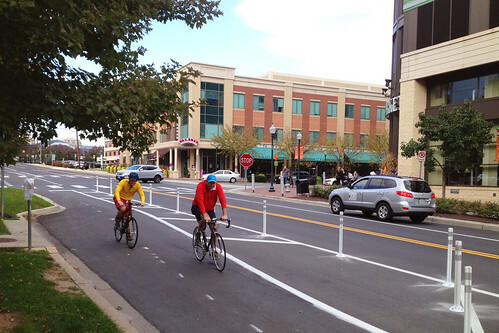 Montgomery County took a big step towards better bicycling this fall with a new cycletrack in White Flint and sharrows, or shared bike lane markings, on several neighborhood streets in Silver Spring. The Woodglen Drive cycletrack won't open until next week, but cyclists are already taking notice. The new Woodglen Drive cycletrack. All photos by the author unless noted. The Montgomery County Department of Transportation began planning for the Woodglen cycletrack last summer. By narrowing the three vehicle lanes and removing parking on one side, engineers were able to add the two-way bike lane with a generous buffer from traffic. Left: What Woodglen Drive looked like just last month. Photo from Google Street View. Right: Woodglen today. Photo by the author. It's only one-third of a mile long, connecting the end of the Bethesda Trolley Trail to Nicholson Lane, though it may get longer when Woodglen is extended to the White Flint Metro station. Even though it's short, the Woodglen cycletrack has really changed the feel of this street. 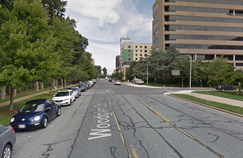 Until recently, Woodglen was still a big, wide suburban road despite being next to Montgomery County's tallest building, the 289-foot-tall North Bethesda Market, which has a Whole Foods and several outdoor cafes at the bottom. The cycletrack narrows the street, which not only slows drivers down, but also gives pedestrians a shorter distance to cross. It feels much more like the urban place Montgomery County envisions for White Flint. 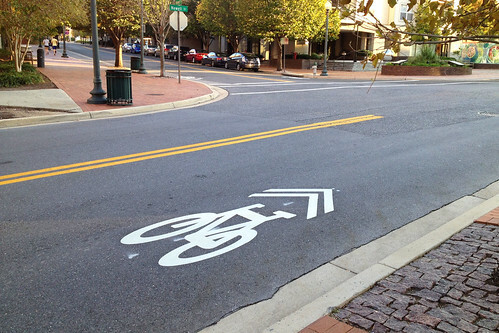 Meanwhile, sharrows recently appeared on several streets in and around downtown Silver Spring, including Bonifant Street, Second Avenue, and 13th Street. Fred Lees, chief of traffic engineering studies at MCDOT, says that they're intended to connect the county's Capital Bikeshare stations to one another. "It was siting the stations, looking at the routes between them, and looking at what we could do to enhance the routes between them," says Lees. MCDOT has also placed sharrows around Bikeshare stations in Shady Grove, and is planning to install more in Bethesda and Friendship Heights next spring. 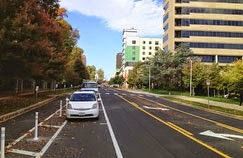 Transportation planners are also studying whether they can extend the Cedar Street bike lane in Silver Spring, which is currently one block long, along Cedar and Spring streets as far as 16th Street. 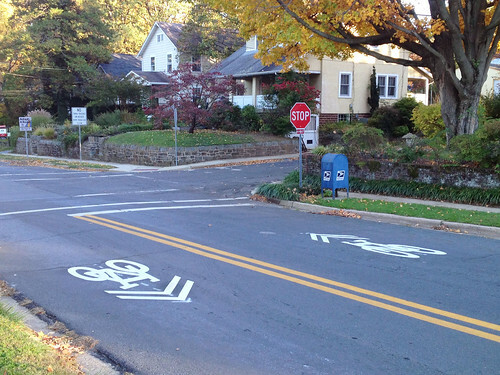 Sharrows on Newell and Kennett streets in South Silver Spring. Places like Silver Spring and Bethesda have some of the county's highest rates of walking and biking to work, and bike commuting in Silver Spring increased by one-third last year. These sharrows help form a bike network here by taking advantage of streets that may be too narrow for bike lanes. But these streets are generally slow and quiet enough that potential bicyclists should feel comfortable using them. That's a contrast with the new sharrows on Georgia Avenue, a Maryland State Highway Administration project. While the sharrows send a message to drivers that they should expect to see bicyclists, Georgia is still a wide, fast road that many bicyclists are reluctant to use. The intersection of Silver Spring Avenue and Grove Street, both of which have sharrows now. In Montgomery County, getting good sidewalks and bike lanes can sometimes be a struggle. While these additions to the bike network are small, they're a promising sign that things are changing.